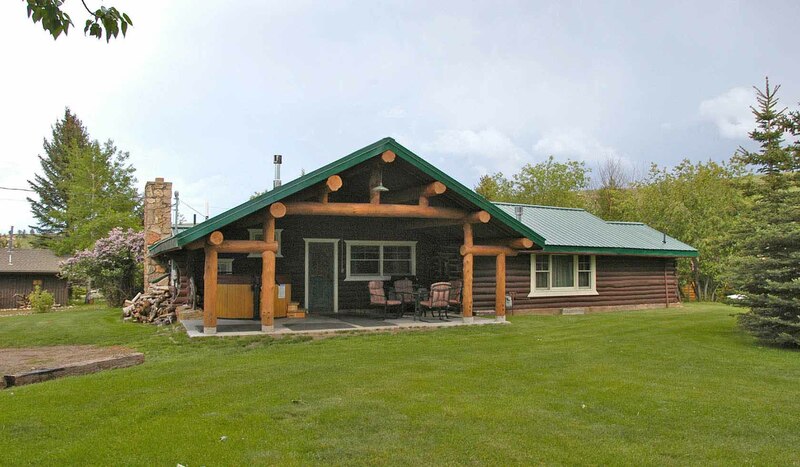 The Rendezvous Lodge of Red Lodge, Montana is a (circa. 1934) log home built from the towering pines that were cleared to make way for the construction of Beartooth Pass. It became the project manager's home during this historic undertaking in highway building. The Rendezvous offers a true sanctuary to one family or multiple families. Many use the home as a gathering point for reunions, celebrations, workshops and retreats. The kitchen is well appointed, roomy and the counter is enriched with 5 bar stools for all to gather. Here is a galley where it is rare to utter "Get out of the kitchen!" The dining area is conveniently close to the kitchen. With the lodge pole ceilings, wagon wheel chandelier, a nice art collection, comfortable furniture and a stunning hearth, the great room is, well great. It is a place you'd expect to have a brandy with Teddy Roosevelt or Bill Cody. The 4 bedrooms are tucked away in their own world, with down quilts, and exceedingly comfortable beds. Each has its own esprit, from playful (bunks and kids) to the grand master bedroom, with a walk in closet, built in dressers and a log frame king bed. The Rendezvous is situated in a park like setting, surrounded by low rock walls. The patio, complete with picnic table and barbecue grill looks out towards the Beartooth Range. The hot tub (6 associates, 8 good friends), shares the large patio, and is only a few feet from the door. A stay at the Rendezvous, with its splendid ambiance is an experience that touches your soul. Here, the past is always present; it is Montana after all, the last best place.